George Jones died last week in Nashville. His astonishing career lasted over 60 years. He died universally acclaimed as the greatest singer in the history of Country music and his recorded output and influence rivals Hank Williams and Johnny Cash. 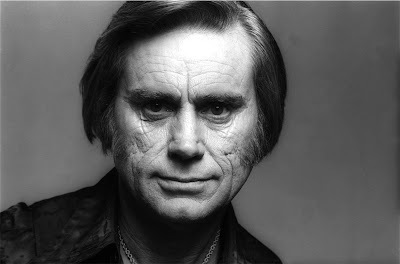 Many of us were first introduced to George Jones through Elvis Costello's Almost Blue which gave him the cool imprimatur that his more obvious contemporaries already had--Haggard, Cash and Willie and Waylon. But the range of his singinging and the feeling his imbued every lyric stand alone in pop music. There will never be another like him again.